And the elk are back! 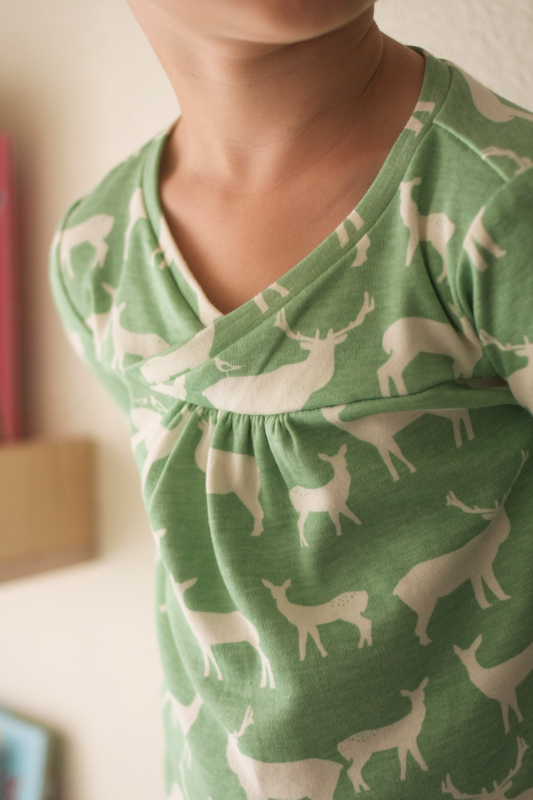 I was sure the (new to me) Oliver + S Field Trip Raglan T-Shirt would be a pattern worthy of the yellow Elk Grove knit I’ve been hoarding since last Kids Clothes Week. It’s true, I almost never cut into the good stuff on my first attempt at a pattern unless it’s Oliver + S.
This pattern is now available on its own in digital format, so if you’re looking for a great raglan pattern but aren’t interested in the accompanying cargo pants, you can buy just the T-shirt portion of the pattern. 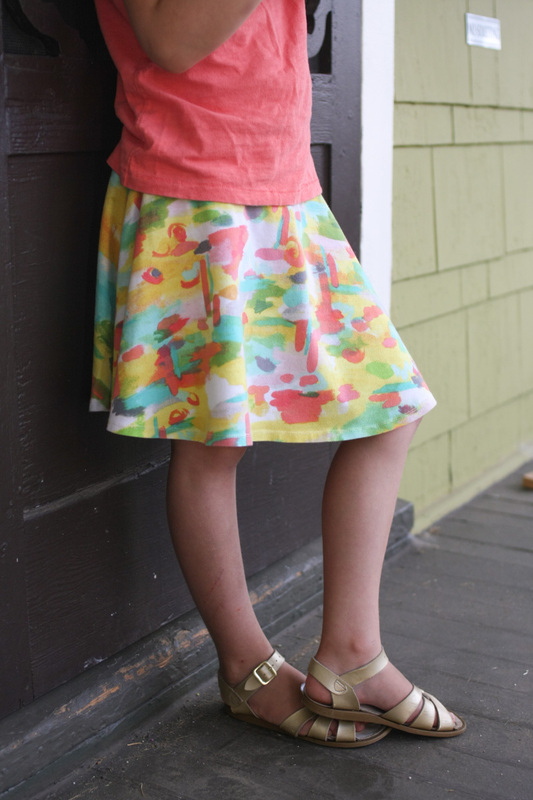 Same goes for the Playtime Leggings and the Seashore Bloomers – both are available as stand-alones. 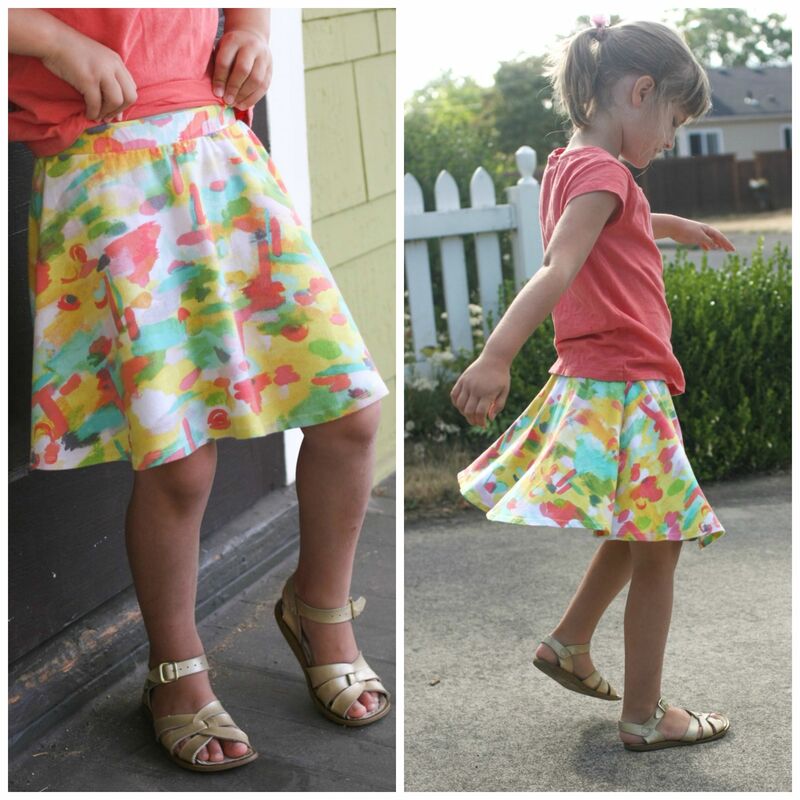 I love the idea of splitting up the patterns this way so you can pick and choose just what you want to sew. 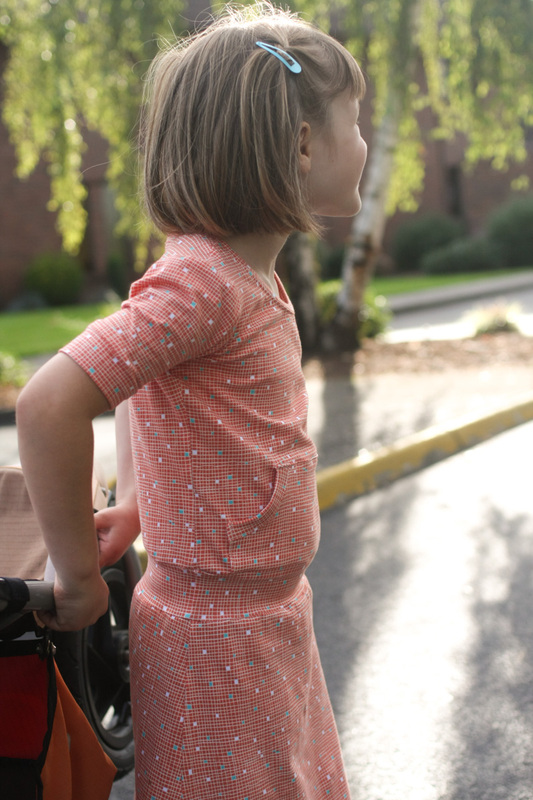 Of course, you never know – I’ve purchased a few patterns for just one garment and ended up loving the one I thought I’d never make (Class Picnic Shorts!). But still, this is a great option to have. 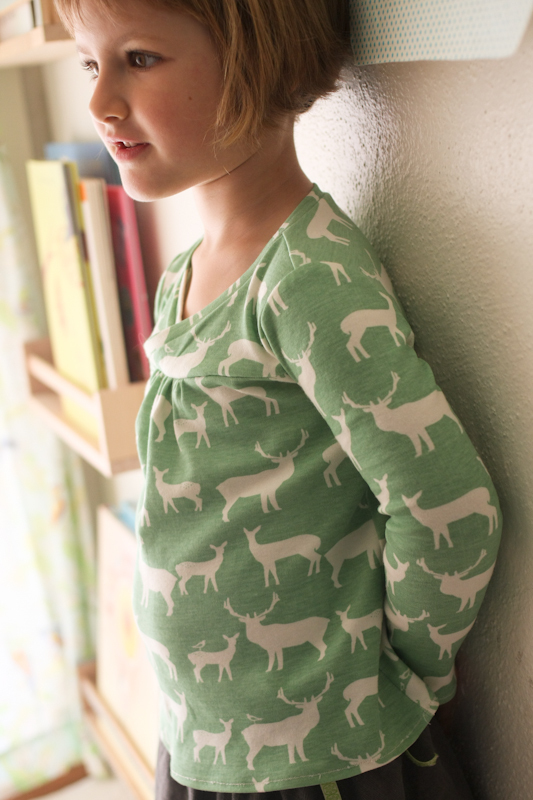 Anyway, Lila’s elk Hopscotch shirt ended up on the small side, and I think I may have overcompensated with this one. It’s an 18-24 months and it’s all-around pretty big on him. 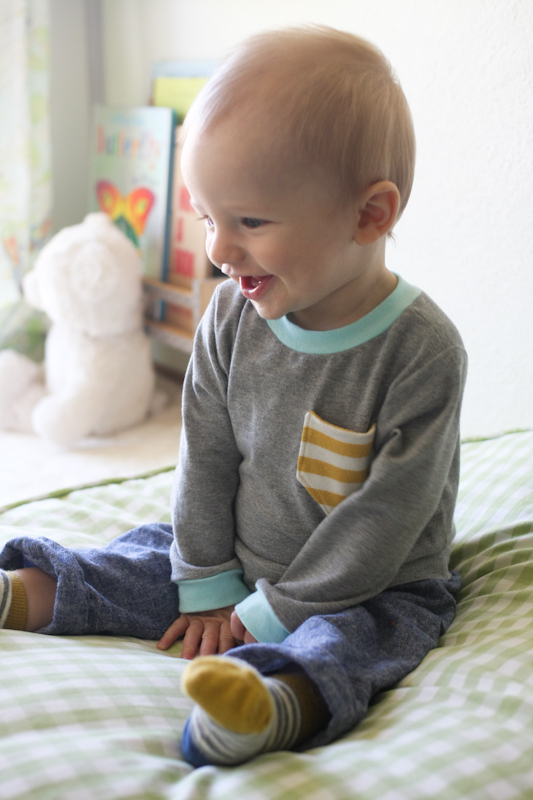 It’s definitely a more relaxed fit than the one other T-shirt pattern I’ve tried, so I think lengthening the 12-18 month size would’ve been fine. 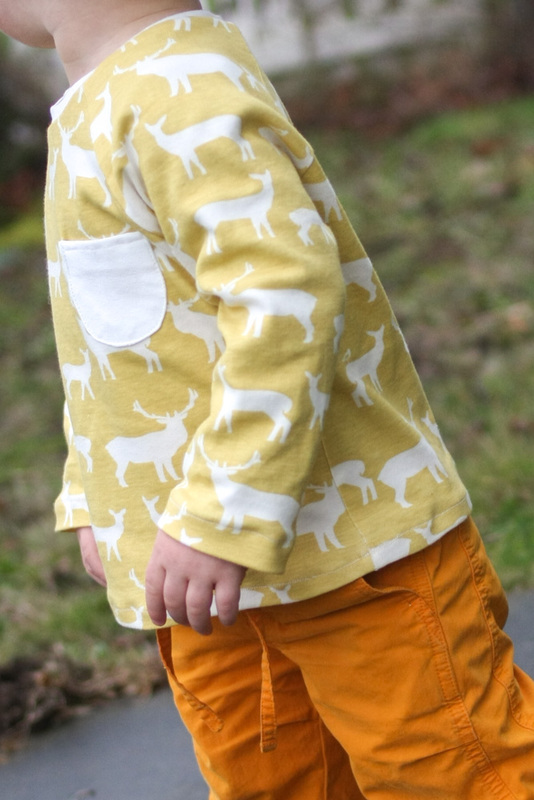 He’s suddenly a huge kid though, so I’m glad this one will fit for awhile – this fabric really is an all-time favorite. 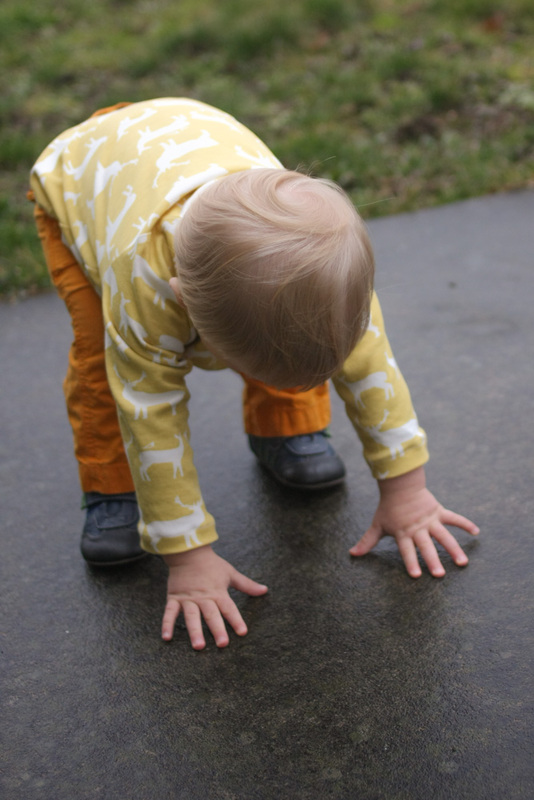 We called it quits after four minutes, and he already had wet hands, wet knees, and a wet behind. His modeling skills are still developing. P.S. 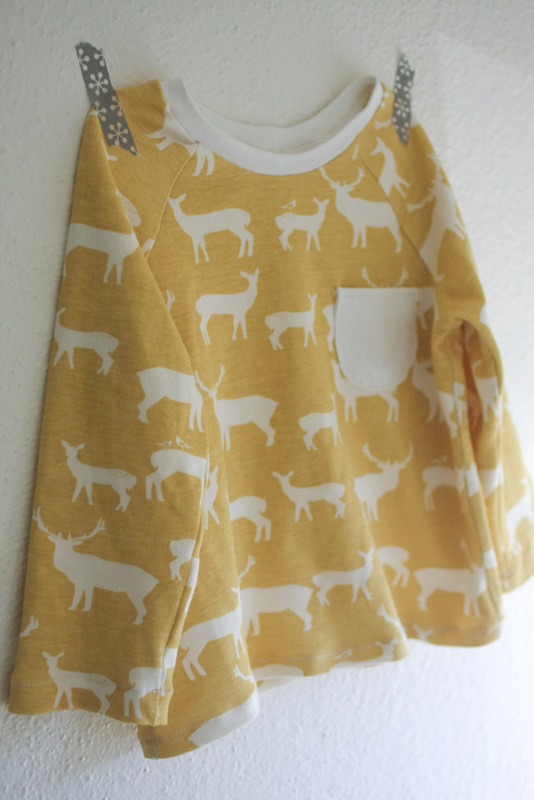 My elk came from LiMa Sews, but it looks like she’s down to a couple Elk Grove Chevron knits. The Flight knits are coming soon though! And thanks to Liesl for providing this pattern – my opinions are, as always, my own. 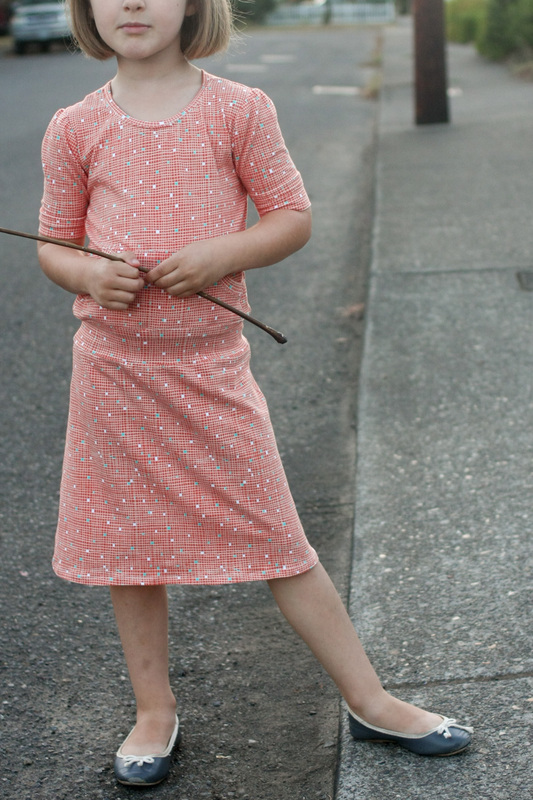 It’s Kids Clothes Week again! 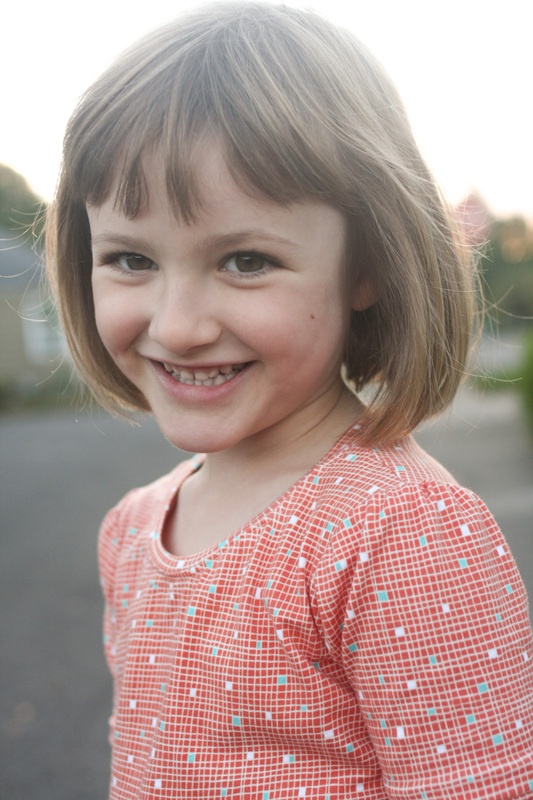 I’ve been working on a couple things, and first up is a little knit top for Lila. 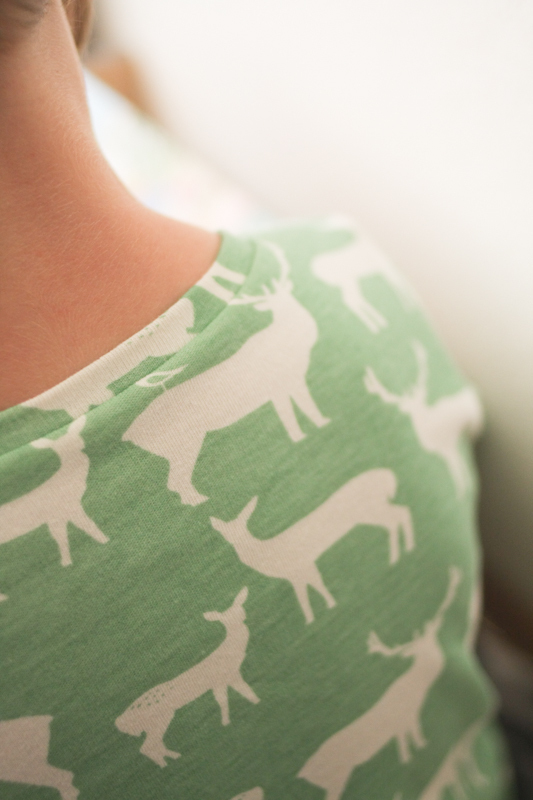 I recently got my hands on some Elk Fam in Pool, a dreamy new knit from Birch Fabrics. I love this stuff. 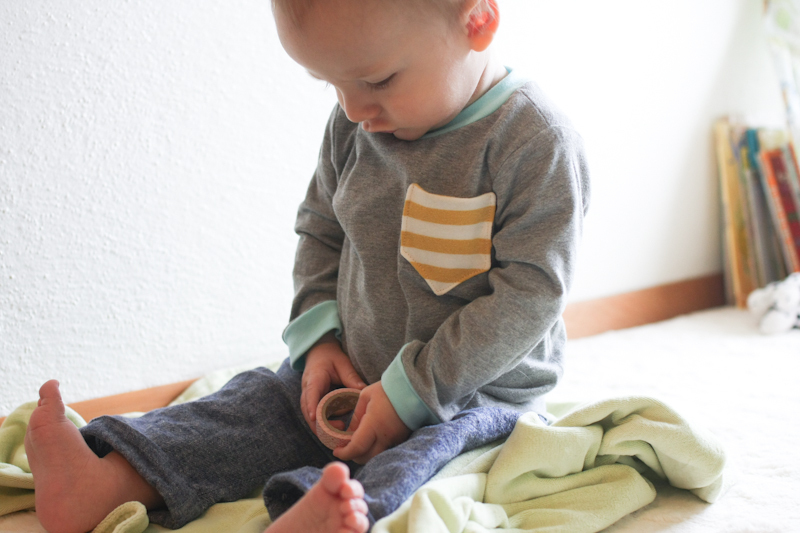 It’s 100% organic cotton interlock, which means it’s stable and easy to work with – it keeps its shape nicely and doesn’t shift or stretch too much under your scissors or presser foot. If you’re new to knits, interlock is a great place to start, and of course this stuff is extra special – besides being organic and super buttery soft, it’s covered in elk! 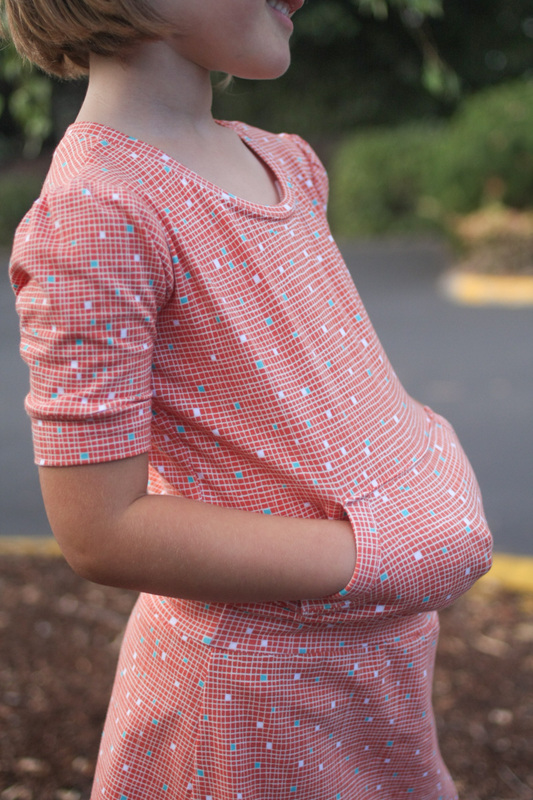 There are other great prints in the Elk Grove knits line, too – poppies (like the canvas I used for Lila’s fall jacket) and chevrons. And the colors divine, especially the yellow. Oh yes, it’s the perfect shade. I picked up a little of that too, for Oscar. 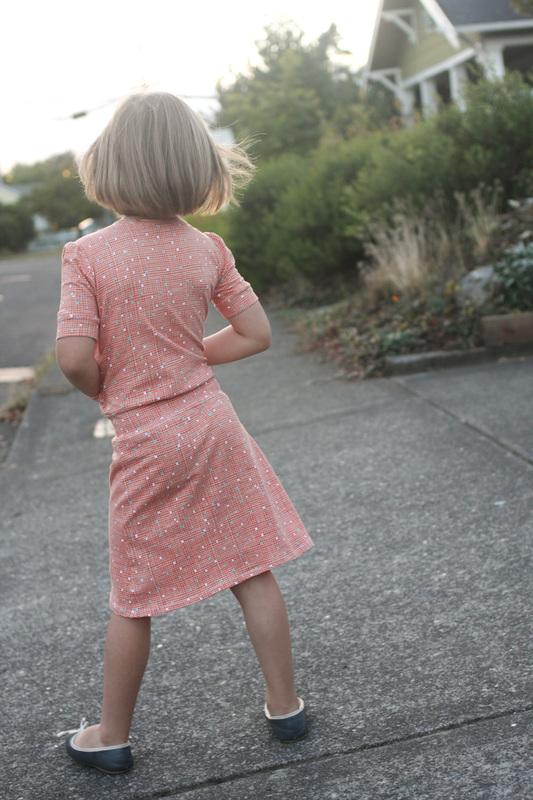 I decided to try a new-to-me pattern (the top is new to me, anyway) and chose the Oliver + S Hopscotch top – the skirt is a favorite of mine and I’ve always wanted to make the top/dress part of the pattern. I like the cross-over style and the gathers, the details are nice and simple. It all came together very easily and took one night to sew (albeit a late night), including tracing and cutting out the pattern. 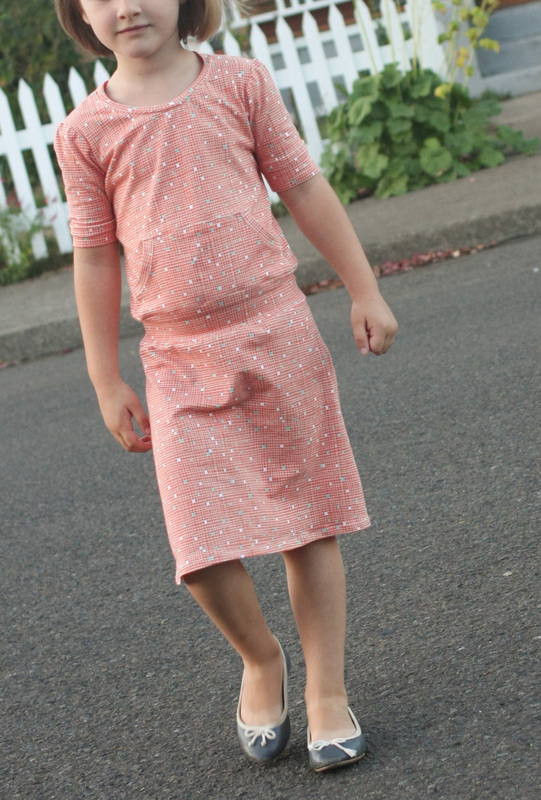 My hems are wavier than I’d like, which is one of the reasons I don’t sew with knits much. I tried tissue paper under the presser foot with the bottom hem, and it helped, but it’s still not perfect. And don’t look too closely at the hem in my photos, because I didn’t pick out all the tissue! Also, I made a size 3 lengthened to 4, and I only ended up turning up a 1/4 inch on the hem because it wasn’t looking long enough. The width is just right, but I like my tops longer, so I’d probably add an inch or so next time so I can give it a proper hem. 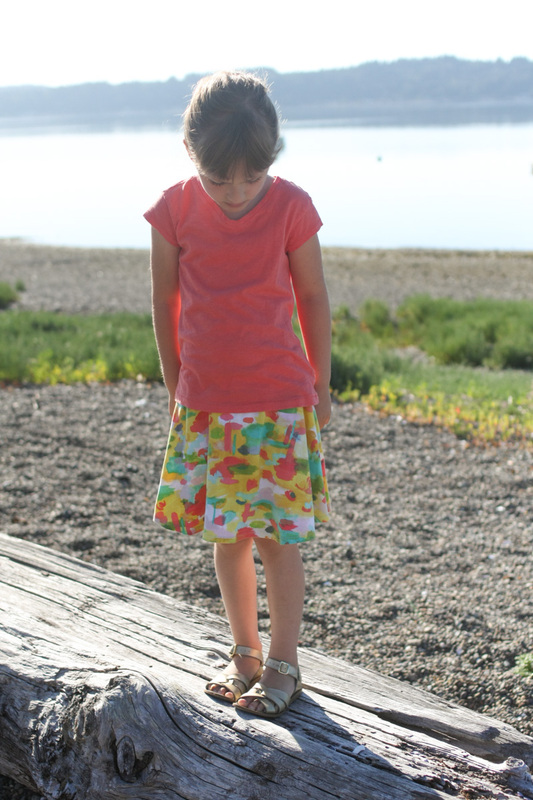 She’s wearing it here with one of her many Swingset skirts – this one was made during last fall’s KCW. My mind has been spinning a bit with all the great things you could make with these knits. 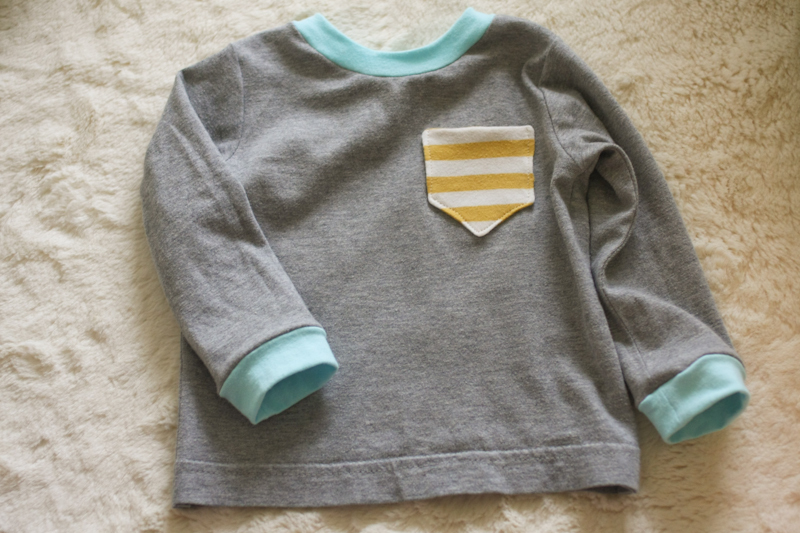 Baby things mostly – blankets, little beanie hats, sleep sacks…all those cute Ottobre outfits I’ve got pinned on my “sewing for baby” board. 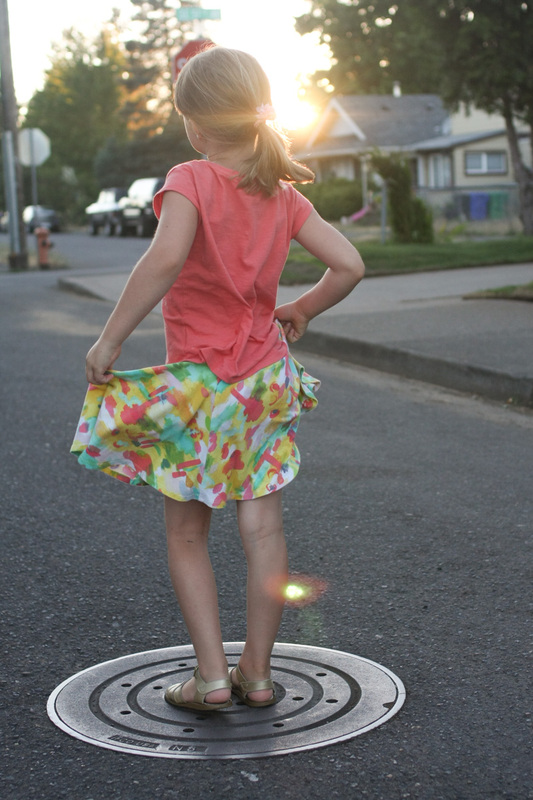 And kid stuff too, of course – t-shirts and leggings and dresses and all sorts of other stuff. Good knits are hard to come by, and these are really, really good knits. 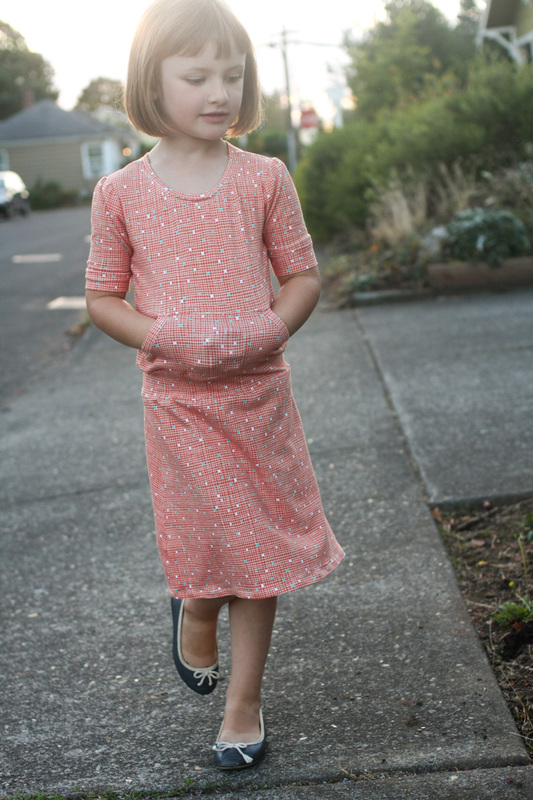 I got the fabric from Linh at LiMa Sews – she has the whole line of Elk Grove knits in stock if you’re looking, as well as lots more from Birch, including the new Eiko line. 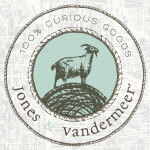 So much good stuff, I tell you, and lots of great new arrivals coming in all the time. 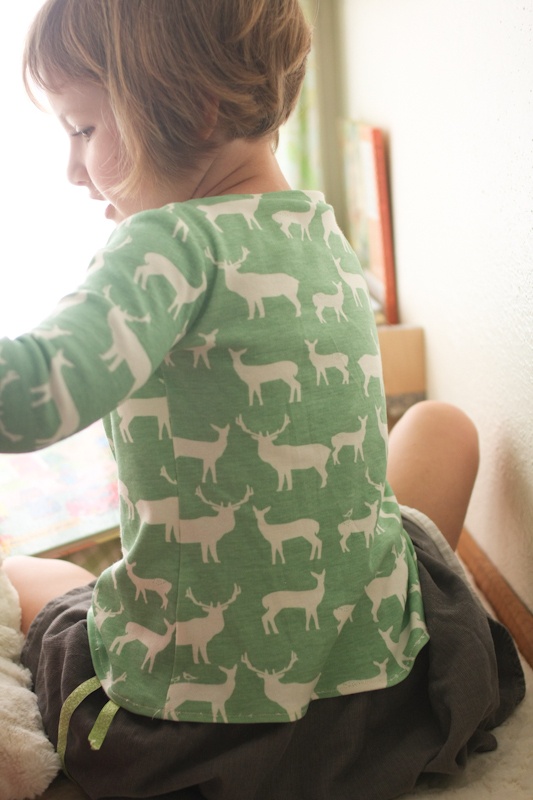 I can’t wait for Birch to release the Flight print in knits this Decemeber, and I think I saw a preview of a beautiful stack of Birch organic fleece on Instagram (please order that stuff too, Linh!). 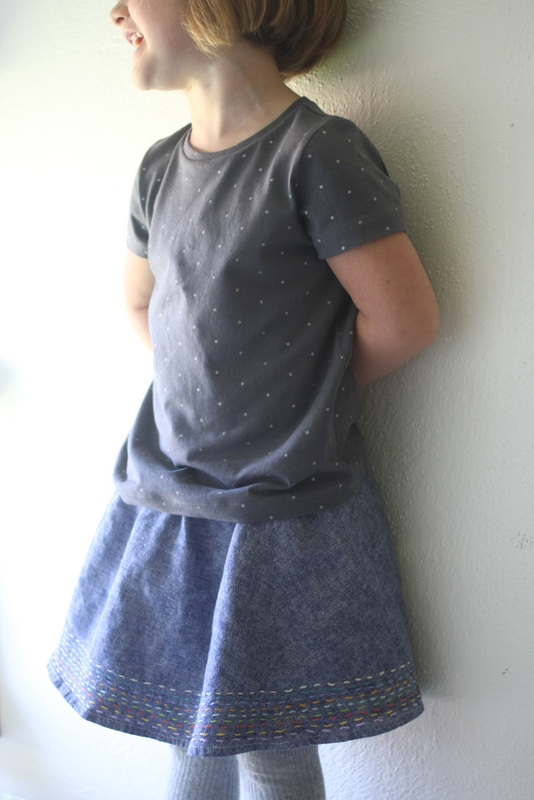 So the only bad news about this cute little top is that Lila says the yoke seam is itchy, and she kept complaining and tugging at it. I wonder if I could bind it with something soft…rabbit fur, or marshmallows maybe. I’ll be working on that. 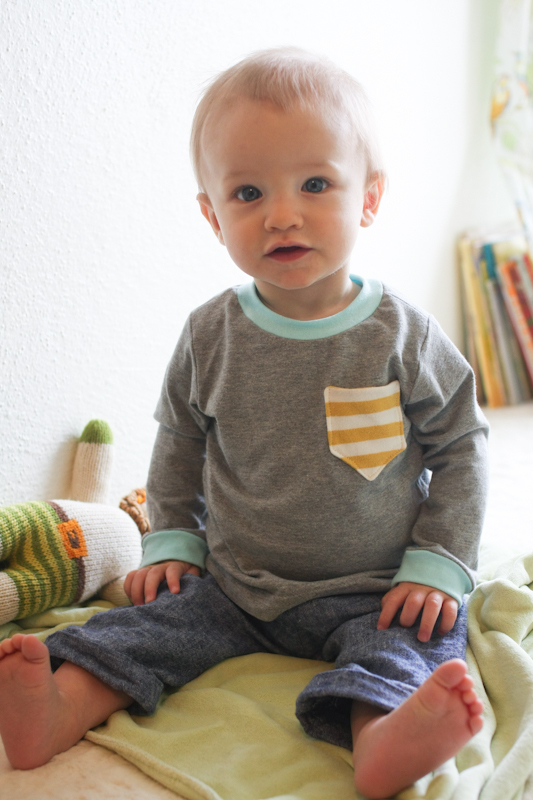 My second project for summer KCW is a simple one – a Made by Rae Flashback Skinny Tee for little Oscar. 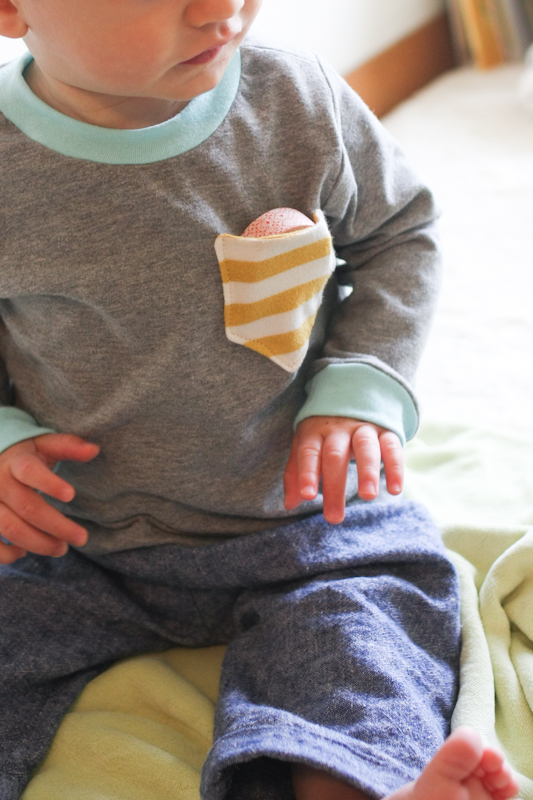 With a pocket, of course, because babies need tiny pockets. To hold their washi tape and such. Lila insisted on shoving that in there. 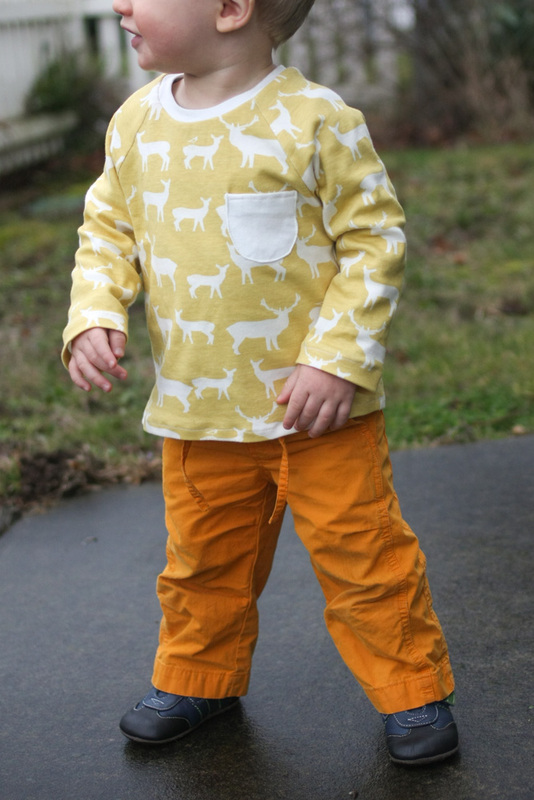 The long sleeves aren’t very summery, I know, but 12-18 months is the smallest size, and I knew it would fit better in the fall. Even though it’s big on him, I still love the fit of this shirt. The knits are re-purposed t-shirts from Old Navy, and the blue is a cotton/lycra blend, since the neckband needs to have some stretch. 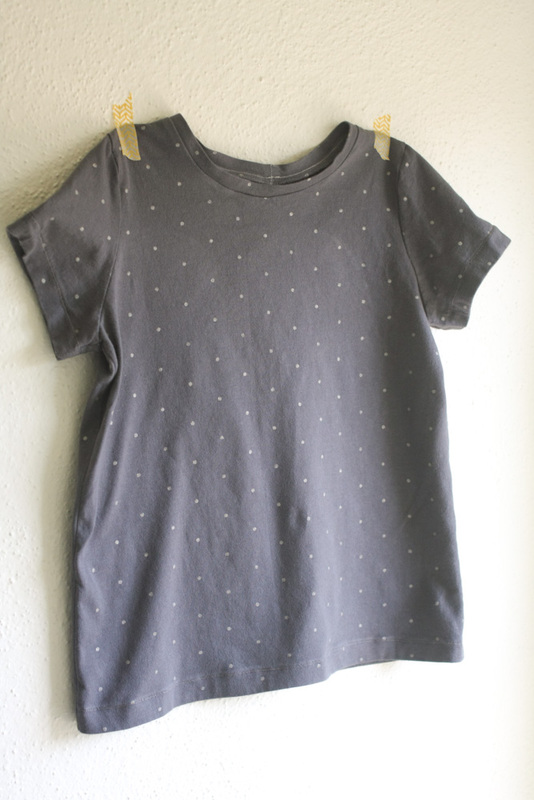 I preserved the hem from the gray shirt, making this extra fast and easy to sew up. 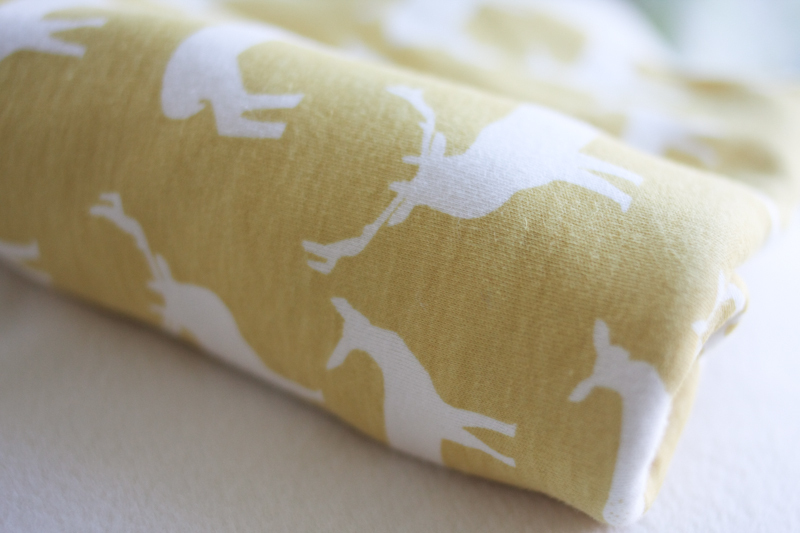 I had forgotten how quick these are to make – it’s a super satisfying project and one that’s sure to get lots of wear. I made one silly mistake on this shirt. 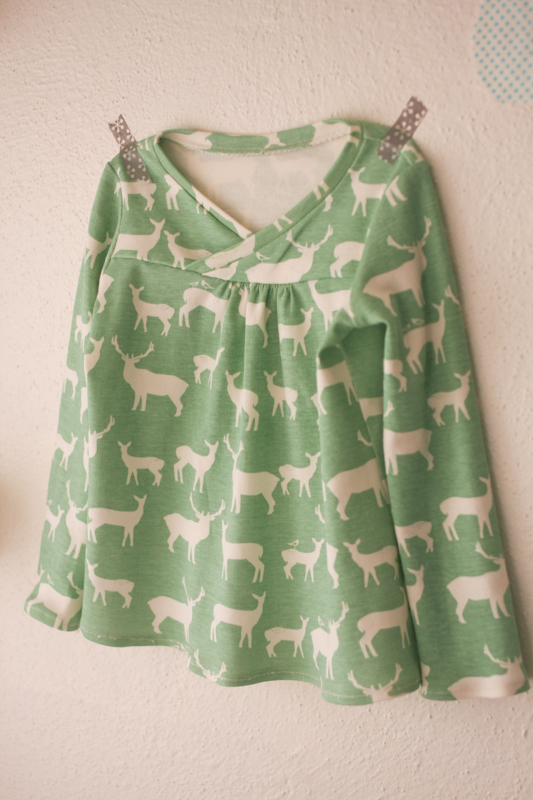 The front and back pattern pieces are identical except for a little dip in the neckline on the front. This is my second time making this size, and apparently I only printed out one pattern piece the first time around. Since it had already been cut on the front/back line, I ended up cutting out two fronts without even noticing. Luckily it doesn’t seem to make any difference when the shirt is on. But when you prepare your pattern pieces, print out two separate pieces for the back and front so you don’t make the same mistake!